I have just discovered a rather unusual gadget, one that has entertained me so much I simply had to blog about it (although I do recognise its ridiculousness). Introducing the Pileus Internet Umbrella! This umbrella doesn’t just keep you dry, it has a screen on the underside, a built in camera, motion sensor, GPS and digital compass screen. 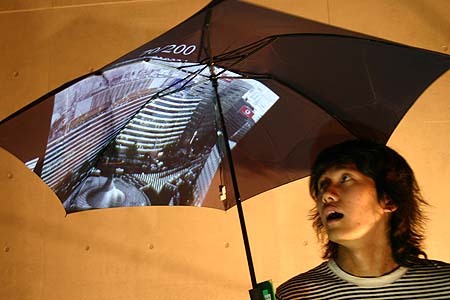 Never again will you get lost in the rain with this baby! It is presently just a prototype but has so pretty cool features; the photo function connects you to Flickr so you can be staring up at a sunny sky if you so wish, and also can be used to upload or view videos. This is all done through a wireless Internet connection that is built into the umbrella. That is not all, the Pileus can also display a 3D on the inside screen so you can literally guide yourself through the city in the rain without getting your iPhone, Smart Phone, paper map wet! See it action here. They say that soon the Internet will be available everywhere, well with accessories like this being created, I’m starting to see how! This entry was posted in fashion, gadgets, Internet, technology and tagged Flickr, Internet, Pileus Umbrella. Bookmark the permalink. Enter your email address to subscribe to the Fashionology blog and receive notifications of new posts by email!